or while I am at work, but never when I am walking. I think when I walk. Yesterday when I was walking, I thought about something that I had heard on a podcast and it troubled me. It was about my phone. I have not gone so far as to invest in a smart phone because I think the design is awful and it is only getting worse (yes, I will tell you how I really feel.). I have a flip phone and I like it, but thanks to Roman Mars and his podcast 99% Invisible, I now see it as woefully inadequate. 99% Invisible is a podcast about design and I like it because it makes me think abut things that I would normally have never considered. Though initially, I went to school to be an engineer, I quickly switched to liberal arts because I am horrible at math. That being said, I still have what I like to believe is an eye for design. The most recent podcast was about interfaces and it was really very challenging. It talked about the interface. The interface is the way that we act and react to and with technology. The QWERTY keyboard, the steering wheel, and more. My favorite and the one that is currently breaking my brain is the phone. The podcast touched on the idea that the flip phone that was initially created by Motorolla was backward. This was the first, real world, flip phone ever created bt it was backward. Why? It was backward because the mouth peice flipped down. The first Motorola flip phone, the MicroTAC, did not sell well. This was because people thought that the first phone of this type would be similar to Capt. 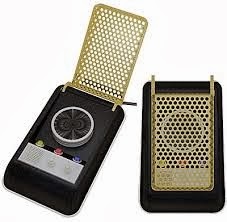 Kirk's communicator. This is an example of how TV has taken over . Let me explain. When I am walking I think and every so often my mind flies to something that I had heard earlier. In this case, I reached for my phone to make a call and that is when I realized that there was something wrong and shortly thereafter, that I am angry at Roman Mars. When you look at the flip phone, the keypad on the bottom along with the mouthpiece, and the screen on the top with the earpiece. This is wrong, people! Think about what would (I contend should) happen if it were reversed. First, you rarely need the keypad while you have the phone to your ear, yet, as you are holding the phone to your ear, your hand is in the best proximity to use the keypad. I took my phone and held it to my ear, upside down. If I am using the phone and someone calls, I have to pull the phone from my ear and look at it. Further, I have to hold the phone away from my head, should I need to do anything while I am in the middle of a call. Now, reverse it. If the phone is reversed with the screen down, towards your mouth then you would, with regular use, be able to use the keypad while you are talking with the phone to your ear without having to pull it away. Also, with a slight shift in the phone, you can see the screen, while still holding the earpeice to your ear simply by looking down. If you had an incoming call, you can very easily see who is calling and even be able to continue talking. If you were dexterous enough, you could even send a text or do something else while talking on the phone if you were good enough with your thumb. When you think about it, it is common sense. Think about it...you would be able to talk, walk, text, and more without doing anything different, It is the elegance of design and it would be perfect. Instead, because some designer, somewhere thought that the communicator should flip down instead of up, we see that as the norm and we do something that is basically counter intuitive. So now, I hate Roman Mars. He has made me think about the way the world is not wrong, but lacking. Common sense would say that he and his podcast have given me an idea of what would be good. I walk through the world with a sort of augmented reality, a lot like Arnold Swartzenegger had as The Terminator. I am embarrassing myself in Starbucks, holding my phone to my ear upside down. I stop to read plaques (always read the plaque). I find myself listening to his podcast and taking a moment to Google something that he is talking about, bubble houses, pneumatic tubes, and more. More than anything, though, I am inspired by his work. 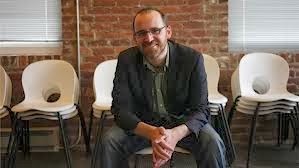 I hate Roman Mars, because he beat me to it. Go to 99% Invisible and join me in hating Roman Mars...or hoping to be a bit more like him. Tiny House Seminar...The world of good design.